Cardiac rhabdomyoma is the most common primary pediatric tumor of the heart and is considered to be a hamartoma of developing cardiac myocytes. 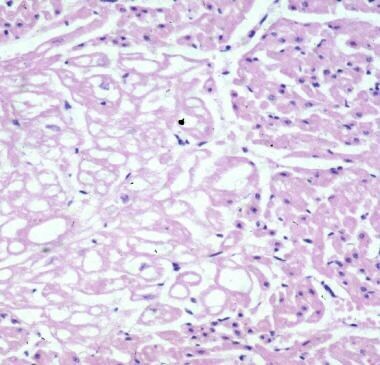 [1, 2, 3] This tumor may demonstrate mild atypical histologic features, but it lacks the capacity for metastasis or invasion. Although the behavior of a cardiac rhabdomyoma is benign, the positioning within critical areas in the heart can lead to lethal arrhythmias and chamber obstruction. The natural history of cardiac rhabdomyomas is one of spontaneous regression. Cardiac rhabdomyomas can occur sporadically, in association with congenital heart malformations, or in the setting of certain genetic disorders. Sporadic mutations are responsible for more than 50% of rhabdomyomas. In rare cases, tetralogy of Fallot, Ebstein abnormality, and hypoplastic left heart syndrome can be associated with cardiac rhabdomyoma; this association complicates both management and prognosis. Cardiac rhabdomyomas most frequently arise in the ventricular myocardium; however, they may also be located in the atria, the epicardial surface, or the cavoatrial junction. The clinical features of cardiac rhabdomyomas vary widely, depending on the location, size, and number of tumors in the heart. Although cardiac rhabdomyomas can be associated with intrauterine fetal demise, many are detected incidentally during routine antenatal sonographic screening. Symptoms of cardiac rhabdomyomas arise because of chamber or valve obstruction, arrhythmias, or failure resulting from extensive myocardial involvement. Tumors obstructing the right-side inflow or the outflow of the ventricles can lead to decreased cardiac output, atrial and caval hypertension, hydrops fetalis, and death. Arrhythmias, both ventricular and atrial, are not uncommon. Wolff-Parkinson-White syndrome has been found to be more common in patients with tuberous sclerosis than in the general population. This increased frequency may be secondary to rhabdomyomas located at the atrioventricular junction. The tumor cells may act to create an accessory pathway. Regression of the tumor is associated with resolution of the arrhythmia and loss of the delta wave on electrocardiography (ECG). Congestive heart failure and a low cardiac output can occur when the tumor extensively involves the myocardium or the ventricular papillary muscles. Cyanosis and decreased peripheral pulses can result. Death occurs because of obstruction of ventricular blood flow, arrhythmias, valve stenosis, or loss of functional myocardium secondary to extensive tumor involvement. The classic clinical triad of tuberous sclerosis includes mental retardation, epilepsy, and facial angiofibromas. The presence of multiple cardiac rhabdomyomas often precedes the manifestation of the cutaneous and neurologic features of the disease. Consequently, the physical examination of the newborn may yield unremarkable results. However, hypopigmented "mountain ash" macules, angiofibromas, and retinal astrocytic tumors are early features that can occasionally be seen at birth. Other late-occurring cutaneous manifestations of tuberous sclerosis include subcutaneous nodules, subungual fibromas, linear epidermal nevi, and café-au-lait pigmentation. Seizures during the neonatal period are not infrequent. Imaging may reveal the presence of cortical or subependymal tubers. Renal angiomyolipomas usually manifest later in life. A detailed family history pertaining to the existence of relatives with features of tuberous sclerosis should also be obtained. Rhabdomyomas are frequently diagnosed by means of fetal echocardiography during the prenatal period. Multiple lesions are often visualized in patients with tuberous sclerosis. Cardiac rhabdomyomas appear as well-circumscribed homogenous hyperechoic masses that most frequently involve the ventricles but can be found at any location in the heart. Small multiple lesions may manifest as a thickened myocardium on ultrasonography and magnetic resonance imaging (MRI). MRI is used if the results of echocardiography are inconclusive or if aggressive surgical management is being planned. On T1-weighted MRI images, rhabdomyomas have a signal intensity similar to that of myocardium. On T2-weighted MRI images, their signal intensity is increased. MRI is also used to evaluate the presence of tuberous sclerosis involving the brain, kidneys, and liver. Echocardiography and MRI are the main diagnostic tools. Cardiac catheterization is seldom required. Endomyocardial biopsy and histologic assessment constitute the criterion standard for diagnosis. Other primary cardiac tumors of the fetus include fibroma, myxoma, teratoma, and hemangioma. On ultrasonography, rhabdomyomas appear as round, homogeneous, hyperechoic masses located predominantly in the ventricles and the interventricular septum. They can be single or multiple. After rhabdomyoma, cardiac fibroma is the second most common hyperechoic cardiac tumor. 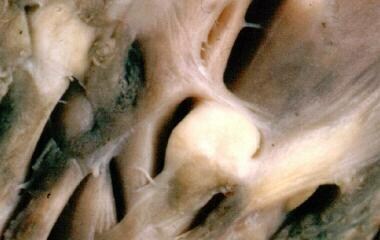 Cardiac fibromas are located in the myocardium (usually the ventricle) and often bulge into the chamber lumen. They are firm or rubbery and do not demonstrate hemorrhage or necrosis. Calcifications are typically present, a feature that distinguishes them from rhabdomyomas. The microscopic features of fibromas include dense fibroblasts and collagen. Elastic fibers can frequently be identified with the use of special stains. Myxomas are endocardium-based lesions that do not infiltrate into the underlying tissue. Commonly located on the left atrial side of the interatrial septum, they can be firm and lobulated, myxoid and gelatinous, or friable and irregular. Myxoma cells possess an abundant eosinophilic cytoplasm and have indistinct cell borders. They arise in a myxoid background. Fibrosis, calcification, and thrombosis are common, and extramedullary hematopoiesis occurs in 10% of cases. They are only moderately echogenic on ultrasonography. Using ultrasonography to distinguish between rhabdomyoma, fibroma, and myxoma when occurring as a single cardiac lesion can be extremely challenging. 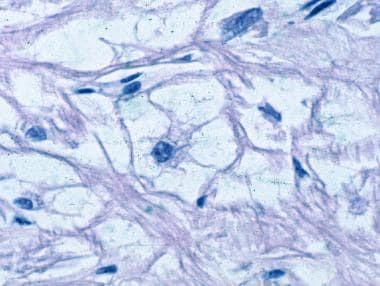 However, a cardiac tumor in a young patient possessing features of tuberous sclerosis or a positive family history is almost certainly a cardiac rhabdomyoma. In contrast, distinguishing rhabdomyomas from teratomas or hemangiomas is less of a diagnostic challenge. Teratomas are extracardiac masses that are located in the pericardial cavity and are usually associated with a pericardial effusion. They are composed of both cystic and solid areas. On histology, mature derivatives of all 3 germ lines (endoderm, ectoderm, and mesoderm) are found. Skeletal muscle, cartilage, liver, pancreas, and glandular tissue have all been observed in cardiac teratomas. These tissues can be readily identified on ultrasonography. Cardiac hemangiomas can occur in any chamber but are usually found in the right atrium. Their microscopic features are diverse. Cardiac hemangiomas can be composed of multiple thin-walled ectatic vessels (cavernous hemangioma), multiple smaller capillarylike vessels (capillary hemangioma), or thick-walled dysplastic arteries, capillaries, and veinlike vessels (arteriovenous hemangioma). On ultrasonography, hemangiomas demonstrate a complex echogenicity with cystic and solid areas mixed with calcifications. Cardiac hemangiomas can be either intramural or endocardial. Intramural hemangiomas are poorly circumscribed lesions that are hemorrhagic and congested. They can be capillary, cavernous, or arteriovenous, and they can contain adipose or fibrous tissue. Endocardial hemangiomas are well-circumscribed lesions that are variably myxoid. They are typically capillary or mixed cavernous–capillary. Liposarcomas may have vacuolated lipoblasts. These are invasive tumors that show features of malignancy, such as tissue destruction and necrosis. Such neoplasms would not be expected in children. Cardiac rhabdomyomas range from 1 mm to 10 cm in their greatest dimension and can be either isolated or multiple. They most frequently arise in the ventricular myocardium but can be located in the atria, the epicardial surface, or the cavoatrial junction (see the images below). Larger lesions can cause obstruction of inflow or outflow tracts. Rhabdomyomas are round or lobulated and are grossly well circumscribed. 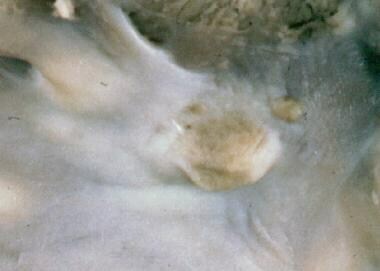 Grossly, rhabdomyoma appears as white nodule in myocardium. Cardiac rhabdomyomas possess a solid tan-white homogeneous consistency and are often watery and glistening on their cut surface. Calcification and hemorrhage are infrequent. Intracavitary extension can occur in as many as 50% of cases. Microscopically, cardiac rhabdomyomas are well-circumscribed nodules that lack a capsule but are distinct from the normal surrounding myocardium. The cells are round or polygonal in shape and are enlarged, with clear cytoplasm (see the image below). The clear cytoplasm is secondary to the loss of glycogen that occurs during standard slide preparation techniques. Glycogen reacts strongly with periodic acid – Schiff (PAS) stain when appropriate technique is used to prepare the slides. Rhabdomyoma is seen at left side of image. Cells are clear, compared with normal myocardium. The nuclei of the rhabdomyoma cells are central or eccentrically located. In some cells, eosinophilic septa stretch from the cell membrane to a centrally placed nucleus, imparting a spiderlike appearance to the cell. These "spider cells" are pathognomonic for cardiac rhabdomyomas and are thought to represent degenerating rhabdomyocytes (see the image below). They may be found scattered in small groups throughout the myocardium or clustered together to form larger nodules. Rhabdomyoma. Microscopy shows typical "spider cell." The septa of spider cells stain strongly for ubiquitin. The ubiquitin pathway facilitates myofilament degradation, intracytoplasmic glycogen vacuolization, and the production of spider cells. Spider cells then undergo apoptosis, myxoid degeneration, and regression of the rhabdomyoma. Mitotic activity is absent and fibrosis and calcification are infrequent. On electron microscopy, the cytoplasm of cardiac rhabdomyoma cells is filled with non – membrane-bound glycogen and small mitochondria. Poorly developed T tubules and fragmented sarcomeres are also present. Cellular junctions that resemble intercalated discs surround the cell periphery. The myogenous origin of rhabdomyoma cells is demonstrated by the strong expression of striated muscle markers, including actin, myoglobin, vimentin, and desmin. Ubiquitin, hamartin, and tuberin are also positive. Proliferation markers such as MIB-1 are negative. The genetic disorder most commonly associated with cardiac rhabdomyoma is tuberous sclerosis. The familial form of tuberous sclerosis is an autosomal dominant disorder characterized by widespread hamartomas that variably involve the brain, kidneys, heart, skin, and other organs. Genetic analysis has identified 2 disease genes: TSC-1 on chromosome 9q34 encodes for the protein hamartin, and TSC-2 on 16p13 encodes for tuberin. These are both tumor suppressor genes that appear to assist in the regulation of growth and differentiation of developing cardiomyocytes. Other genetic disorders associated with cardiac rhabdomyomas include Down syndrome in patients with tuberous sclerosis and basal cell nevus syndrome. Cardiac rhabdomyomas tend to grow up to approximately 32 weeks' gestation, after which point the cells lose their ability to divide and undergo apoptosis. This process is probably mediated by ubiquitin, a regulatory protein that is strongly expressed in rhabdomyoma cells. Ubiquitin stimulates the degradation of myofilaments. Apoptosis ensues and leads to the eventual regression of the hamartoma. Partial or complete resolution occurs in most cases, regardless of the initial size of the tumor. The tumor is mitotically inactive and lacks the capacity to spread. No staging system exists. Because the natural history of the rhabdomyoma is one of regression, most patients can be managed conservatively. Conservative management includes frequent monitoring with echocardiography and electrocardiography (ECG). Patients with arrhythmias are treated with antiarrhythmic medications. If medical treatment fails to control the arrhythmias or blood flow is severely obstructed, surgical management is recommended. Regression of the tumor is associated with resolution of the arrhythmia. Surgical intervention is reserved for patients who have symptoms of severe hemodynamic compromise or intractable arrhythmias. Operative management involves removal of the intracavitary portion of the tumor without complete excision of the entire lesion. Becker AE. Primary heart tumors in the pediatric age group: a review of salient pathologic features relevant for clinicians. Pediatr Cardiol. 2000 Jul-Aug. 21(4):317-23. [Medline]. Elderkin RA, Radford DJ. Primary cardiac tumours in a paediatric population. J Paediatr Child Health. 2002 Apr. 38(2):173-7. [Medline]. Holley DG, Martin GR, Brenner JI, et al. Diagnosis and management of fetal cardiac tumors: a multicenter experience and review of published reports. J Am Coll Cardiol. 1995 Aug. 26(2):516-20. [Medline]. Uzun O, Wislon DG, Vujanic GM. Cardiac tumors in children. Orphanet J Rare Dis. March 2007. 2:11. Isaacs H Jr. Fetal and neonatal cardiac tumors. Pediatr Cardiol. 2004 May-Jun. 25(3):252-73. [Medline]. Chao AS, Chao A, Wang TH, et al. Outcome of antenatally diagnosed cardiac rhabdomyoma: case series and a meta-analysis. Ultrasound Obstet Gynecol. 2008 Mar. 31(3):289-95. [Medline]. Lacey SR, Donofrio MT. Fetal cardiac tumors: prenatal diagnosis and outcome. Pediatr Cardiol. 2007 Jan-Feb. 28(1):61-7. [Medline]. Harding CO, Pagon RA. Incidence of tuberous sclerosis in patients with cardiac rhabdomyoma. Am J Med Genet. 1990 Dec. 37(4):443-6. [Medline]. Burke A, Virmani R. Pediatric heart tumors. Cardiovasc Pathol. 2008 Jul-Aug. 17(4):193-8. [Medline]. Freedom RM, Lee KJ, MacDonald C, Taylor G. Selected aspects of cardiac tumors in infancy and childhood. Pediatr Cardiol. 2000 Jul-Aug. 21(4):299-316. [Medline]. Krapp M, Baschat AA, Gembruch U, Gloeckner K, Schwinger E, Reusche E. Tuberous sclerosis with intracardiac rhabdomyoma in a fetus with trisomy 21: case report and review of literature. Prenat Diagn. 1999 Jul. 19(7):610-3. [Medline]. Grebenc ML, Rosado de Christenson ML, Burke AP, Green CE, Galvin JR. Primary cardiac and pericardial neoplasms: radiologic-pathologic correlation. Radiographics. 2000 Jul-Aug. 20(4):1073-103; quiz 1110-1, 1112. [Medline]. Patel R, Lim RP, Saric M, Nayar A, Babb J, Ettel M, et al. Diagnostic Performance of Cardiac Magnetic Resonance Imaging and Echocardiography in Evaluation of Cardiac and Paracardiac Masses. Am J Cardiol. 2015 Oct 19. [Medline]. Vaughan CJ, Veugelers M, Basson CT. Tumors and the heart: molecular genetic advances. Curr Opin Cardiol. 2001 May. 16(3):195-200. [Medline]. Borkowska J, Schwartz RA, Kotulska K, Jozwiak S. Tuberous sclerosis complex: tumors and tumorigenesis. Int J Dermatol. 2011 Jan. 50(1):13-20. [Medline]. Yinon Y, Chitayat D, Blaser S, Seed M, Amsalem H, Yoo SJ, et al. Fetal cardiac tumors: a single-center experience of 40 cases. Prenat Diagn. 2010 Oct. 30(10):941-9. [Medline]. Degueldre SC, Chockalingam P, Mivelaz Y, Di Bernardo S, Pfammatter JP, Barrea C, et al. Considerations for prenatal counselling of patients with cardiac rhabdomyomas based on their cardiac and neurologic outcomes. Cardiol Young. 2010 Feb. 20(1):18-24. [Medline]. Wacker-Gussmann A, Strasburger JF, Cuneo BF, Wiggins DL, Gotteiner NL, Wakai RT. Fetal arrhythmias associated with cardiac rhabdomyomas. Heart Rhythm. 2014 Apr. 11 (4):677-83. [Medline].